Today was our last day on the mountain. We were awoken around 7am with hot water and tea as usual and of course had a wonderful breakfast delivered to us by Humphrey whom I gave my tent lantern to as a gift for being so good to us (there’s wasn’t very good). After breakfast we had a group photo with the entire expedition and conducted the tipping ceremony. Tembea pole pole. Hakuna matata! Kunywa maji mengi. Hakuna matata! Na Mawenzi, mlima mrefu sana. How are you? Very well! Walk slowly, slowly. No trouble! You’ll get there safe. No trouble! Drink plenty of water. No trouble! Kilimanjaro, such a high mountain. Also Mawenzi such a high mountain. Like a snake, like a snake! 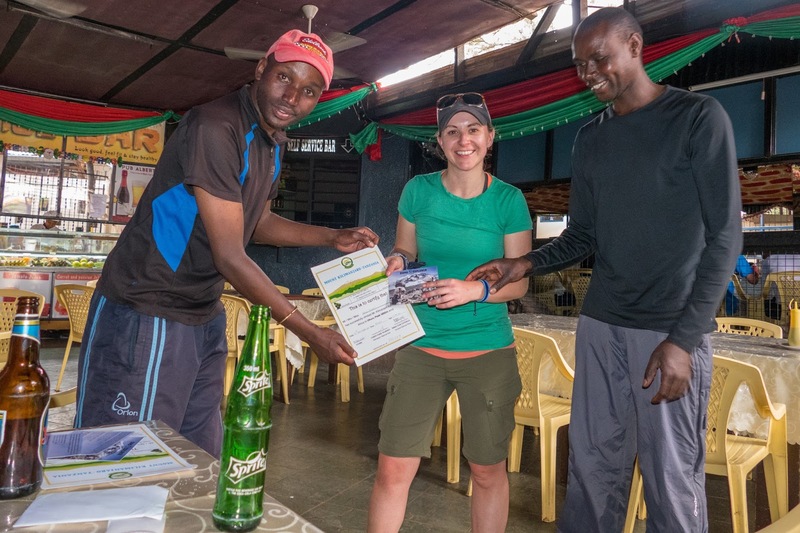 We then quickly packed up with me thinking that if we hurried we could catch Jaffa on the trail and I could help him with all the medical supplies I had carried along for us that we never used. Although we rushed along we never did catch up to him. On the way down we again chatted with Mike and Emanuel a lot, especially about the treatment of Porters on the mountain. 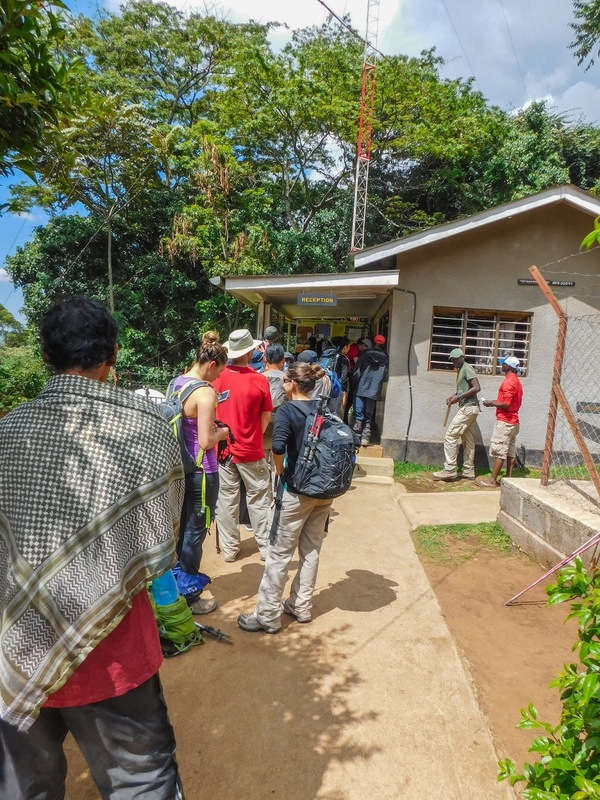 We learned that some companies, like Zara, pay bribes to gate officials to allow their porters to carry more weight so they can pay less to go with climbers up the mountain. 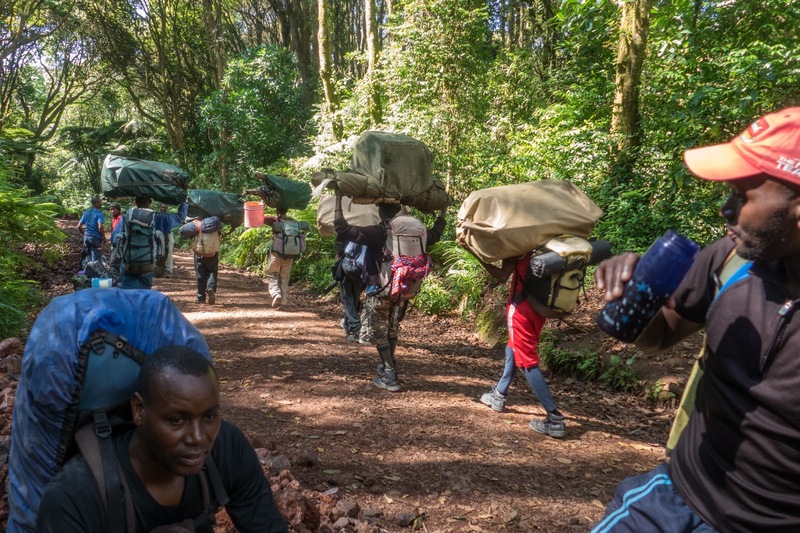 Although we had thought 17-18 porters for us was nuts it meant that they were carrying less and still getting paid good salaries by Duma. Mike and Emanuel were clearly both sincere when they told us they were proud to work for Duma. 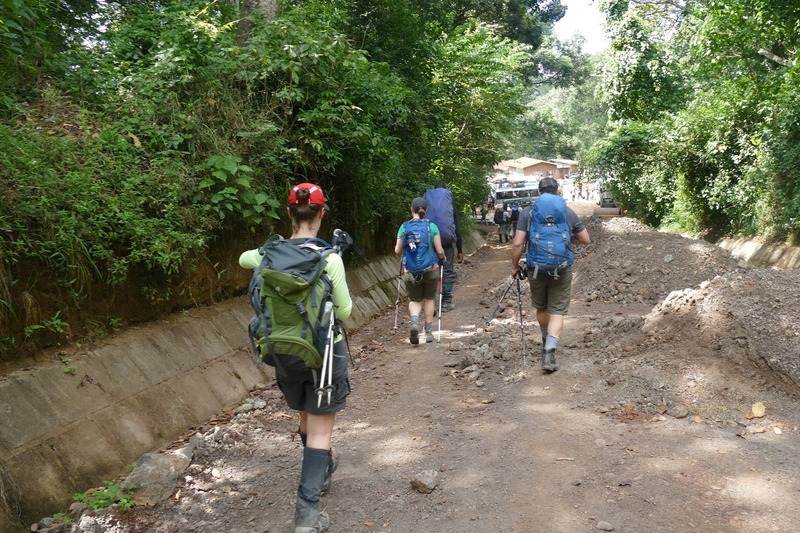 The trail out was pretty much all packed mud and we couldn’t imagine how dangerous it would have been if it had been raining like it was for us on our way in through the Machame Gate. 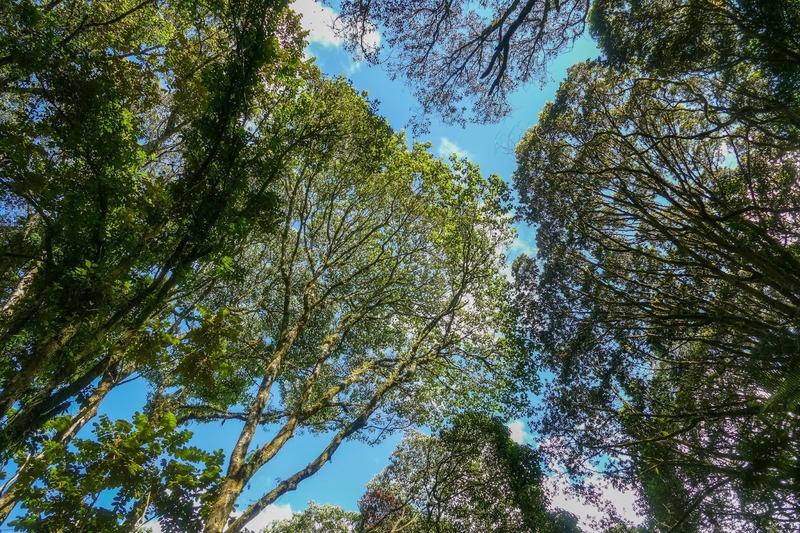 We gradually passed from 15’ vegetation into very tall rainforest with vines and monkeys all around us! Yup! Monkeys! 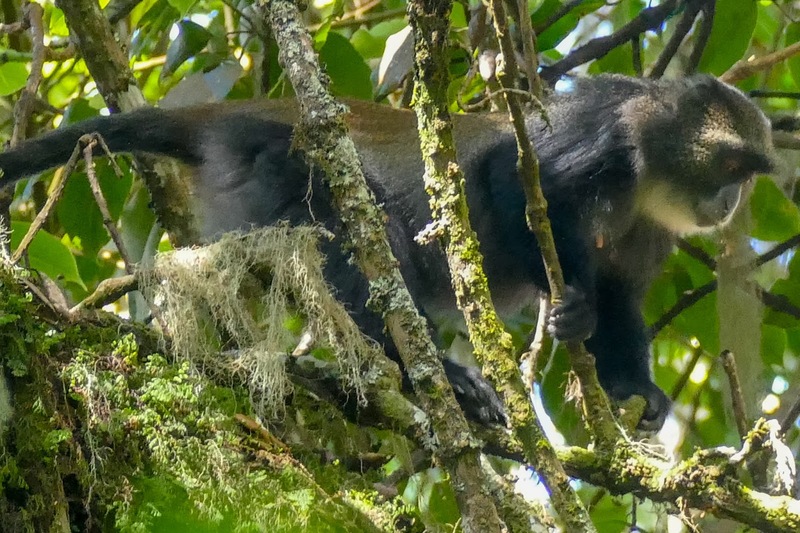 We had no idea that we would see wildlife on Kilimanjaro and were surprised to see both big Colobus monkeys with their long white tails and smaller blue monkeys in the trees surrounding the trail. 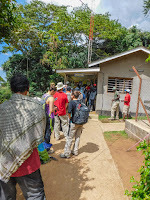 We probably would have made it to the gate 30 minutes earlier if it wasn’t for me standing around trying to snap photos and video of the monkeys as it was our first African mammal experience in Tanzania. 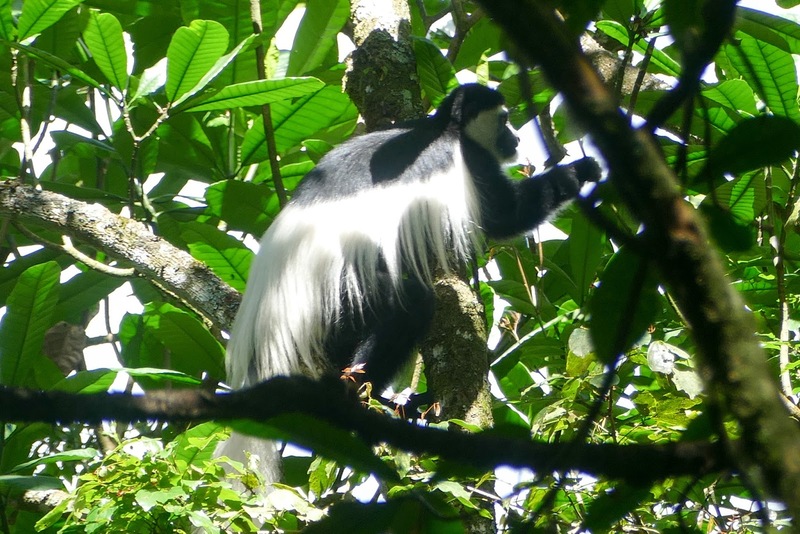 Although we would see the blue monkeys on our safari it was the only place where we saw the Colobus monkeys. 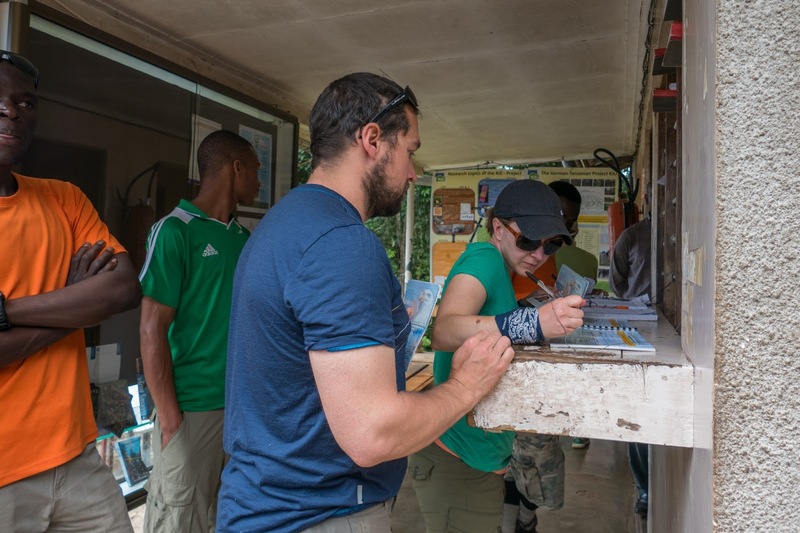 As in the way in from Machame we also passed by a lot of signs below the vegetation describing what it was and Mike and Emanuel filled in details such as what the locals used them for and what they were good at treating/preventing like Malaria, etc. 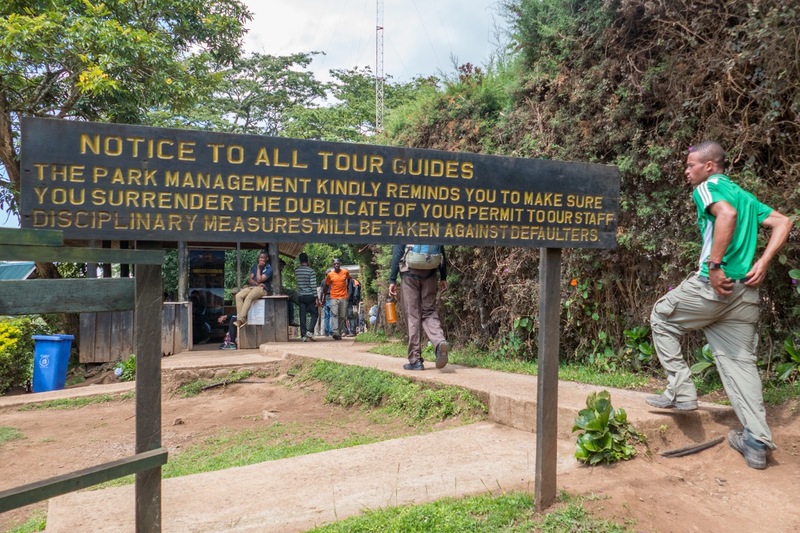 We left camp at 8:30am and made it to the 5,400 foot Mweka Gate at 10:55am where stopped for a bunch of pictures with the sign. No, we didn’t get a picture of Emy walking smack into it and snapping her glasses… that would have been a great shot! 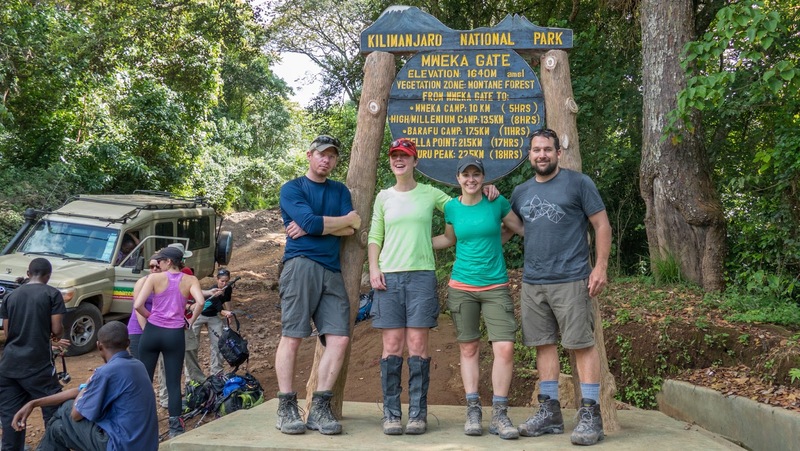 :) In total, according to the GPS track I was recording the entire climb, it took us 38 hours of walking over 36 miles of varied terrain and over 25,000 feet of elevation gain to the 19,341 foot summit Kilimanjaro. Yes, by far, the biggest climb of all our lives! Emy, Eric and Emily headed off to the sign out building but I stuck around with the porters when I located Jaffa with the injured foot. I asked to see him and his foot and he shyly came to sit on the edge of the bus for me and pulled off his sock. What I saw was shocking and almost brought me to tears. It was surficial but looked extremely painful. 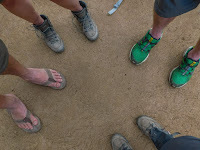 The boots he used had worn blisters through the top of his foot which had then burst and kept wearing through deep into the tissues of his foot. I didn’t see muscle but assumed it was close. I took out my medical kit and started putting square tabs of 2nd skin all over his foot followed by medical cream then large white medical pads which I then topped off with some moleskin sheets to cover it all up. He clearly needed gauze and better treatment but that would do until he got to a medical center. I also gave him 4 Aleve rather than the Oxy I had which I wasn’t sure was entirely safe for him. That many Aleve would surely dull the pain for the ride home though. He thanked me with a big genuine smile and Emily later made sure he had his tip envelope. This brings me to the only negative thought I had about the climb and our guides. I can’t assume to know what happened as it was kept from us. The injury had clearly been many days in development to get to the state it was in and perhaps Jaffa only told Emanuel and Mike this morning out of pride, etc. That’s all fine. What I can’t rectify in my head is that with their medical training, why hadn’t either guide demanded to look at his foot in camp that morning and treat it for his final 4,600 foot descent to the gate? I understand that as the clients we are #1 priority but it was clear that we were all fine without any need of medical attention. There was a long line of people waiting to sign out at the gate lodge and Humphrey joined us in the line with a big smile. We think he really liked us and we both had arms around each other as we waited to sign out and collect our summit certificates. I also took the moment to wash up after the climb and treating the injured foot of a porter. Unlike the Machame Gate, this gate was riddled with peddlers trying to sell us everything under the sun that had “Kilimajaro” written on it. I was able to talk one of them down to $10 a piece for two t-shirts for Emily and I but refused everything else. 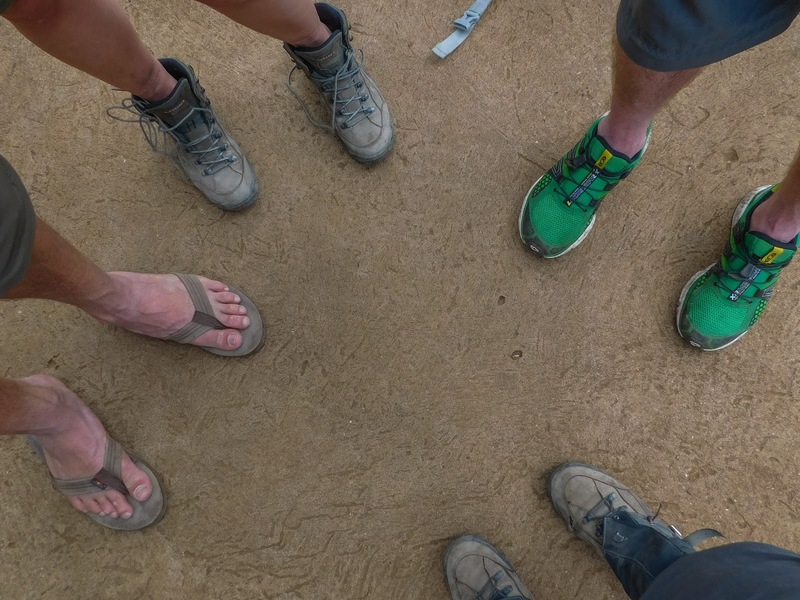 One woman wanted to brush off the dirt from our boots for money! There was obviously no regulation here for selling stuff to tourists. 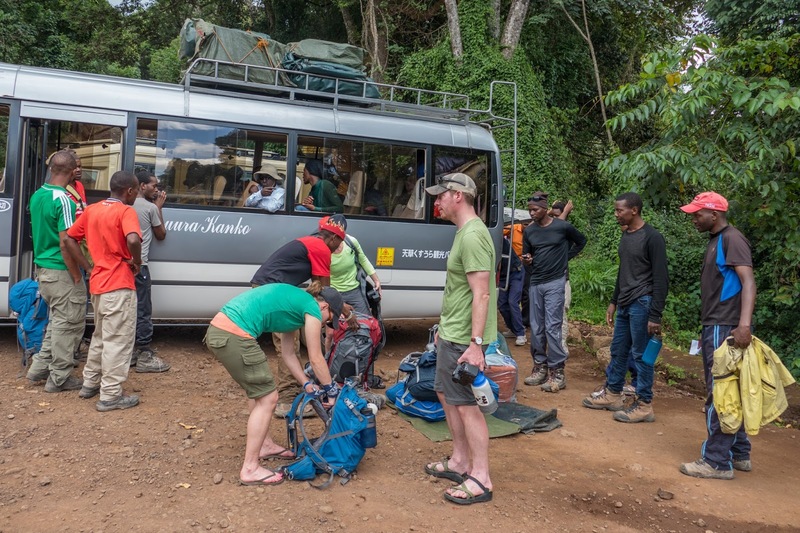 From there we loaded up all our gear into the bus and headed towards Moshi for some lunch bought for us by Duma at a place called “Kool Bar” where I impressed our guides by opening the beers with my ring. The only thing we had to pay for was our delicious, delicious 20oz beers :). It was there that Mike and Emanuel told us about the fermented banana “alcohol” the locals make that is far, far cheaper than what we were drinking. We explained to them that we call that “moonshine” in the U.S.! We also learned more about Mike and Emanuel over lunch. 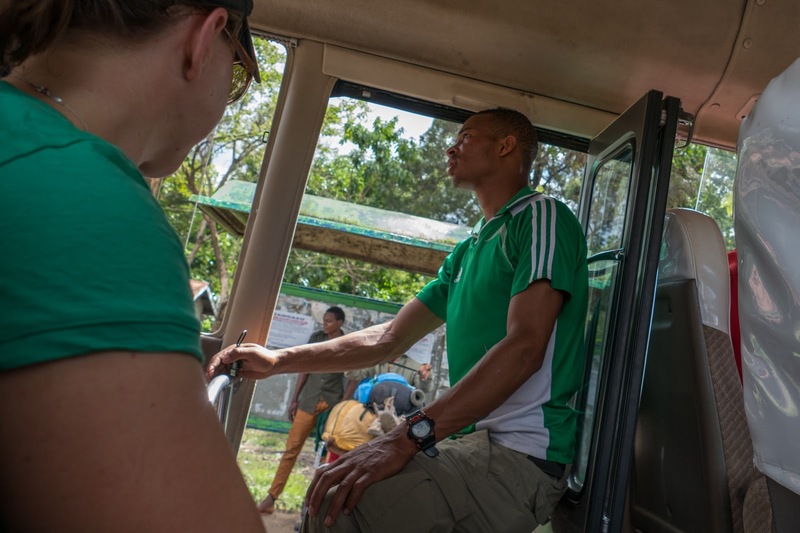 Mike Emanuel wants to be a Safari Guide instead as it is easier. Mike doesn’t drink. 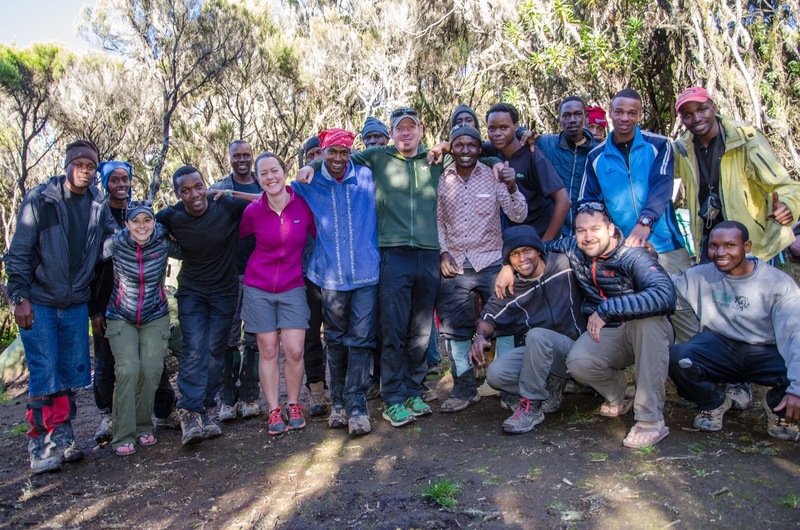 Our porters ranged in ages from 46 to 20 (Joshua on his first climb). This was Mike’s 49th successful summit with Emanuel well over 60 climbs. Duma mostly caters to English, American, Canadian and Australian clients so English is easiest for them to learn. After showing them a video of Leo we learned that dogs in Tanzania were primarily only for protection. 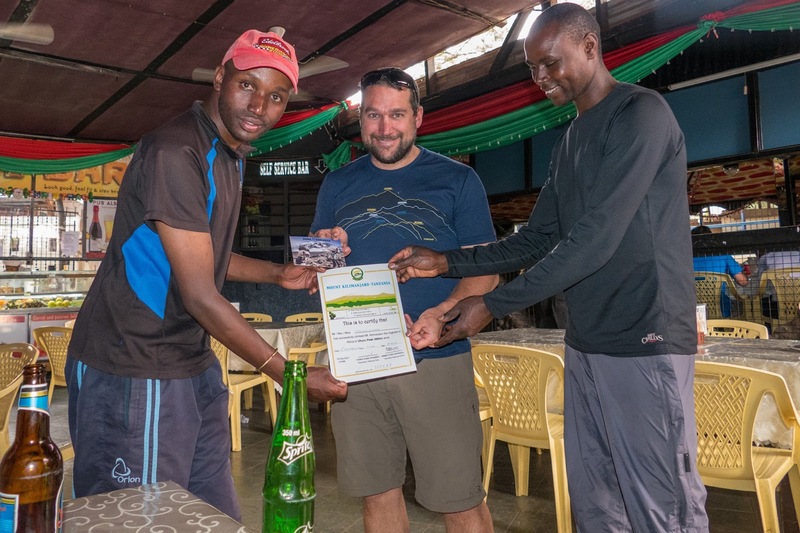 We had the usual fried chicken and french fries that seems so popular in Tanzania and then each of us go up for photos with Mike and Emanuel who handed us our certificates from the climb. 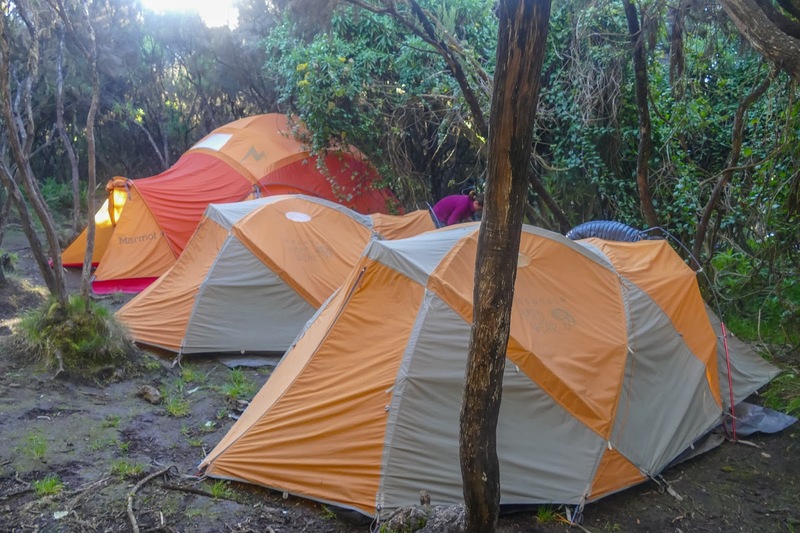 They told us their favorite clients were Americans and they were very impressed that we made the summit under such windy, unusual conditions and that very few Tanzanians they know have been to the top. They told me they were impressed that I carried what I carried up the mountain as well. 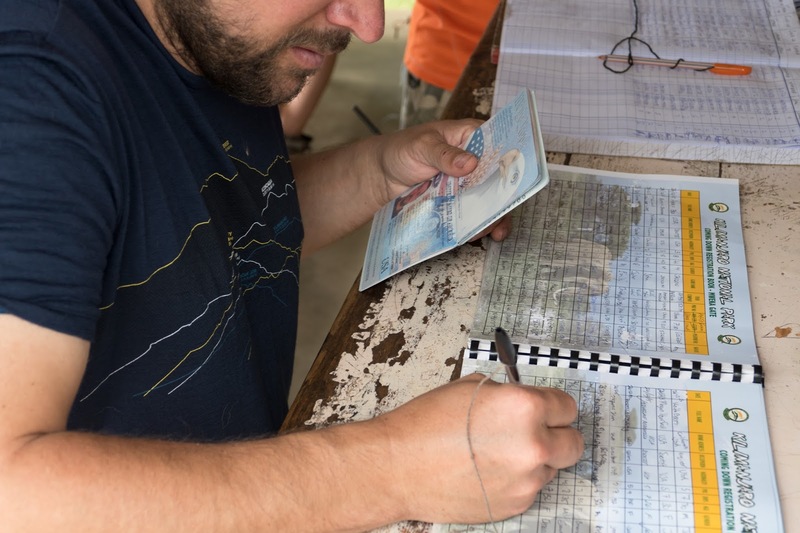 They also talked to us about how important tourism is for their country and how they and Duma depend on the good word we spread as “ambassadors” about our experiences when we get back to America. Eric later looked up how much an average Tanzanian makes in a year and we realized in shock that we make that in 1.5 days at our current jobs! 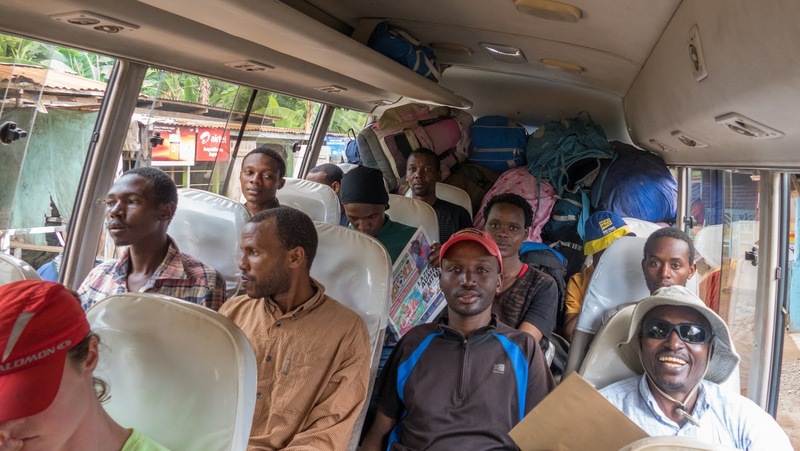 From there we headed back to Arusha which was about an hour long drive. I again put my GoPro on the side of the bus for a time-lapse drive back and it was the only time that we saw someone give us the finger. Some Tanzanian’s still think that if a photo of them is taken they lose a bit of their soul… so I was trying to be discreet but I guessed I may piss off someone at some point… Another guy on a motorcycle yelled “hey paparazzi” but with a big smile which we all laughed at. Along the way we dropped off various porters at their home villages and said warm goodbyes and thank-you’s to each. Thankfully, they all made it back for a long afternoon with their families on “Boxing Day” which seemed to be as important to many of them as Christmas is to us. At one of the places we stopped at for snacks we saw a girl in another bus with a Johns Brook Lodge hat on that I yelled to and told her I grew up in Lake George with a big smile. She was different then the other American’s we saw, whom the majority of were from the Bay Area. 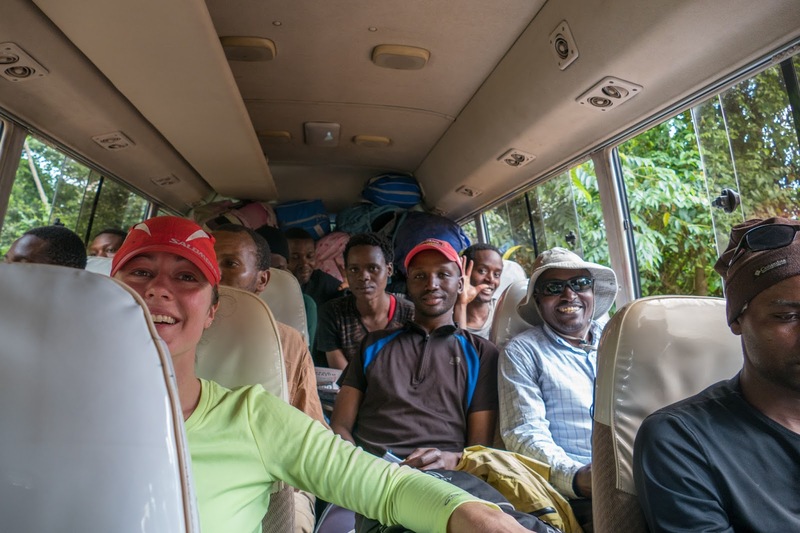 We got back to Arush around 3:15 and because of a scheduling mistake at the African Tulip we were re-booked by Stacy to the Arusha Hotel. The manager of the African Tulip felt so bad about this that he sent us a fruit basket and a bottle of wine to the Arusha Hotel for us which was a pleasant thing to arrive to after our climb. I can’t tell you how wonderful the shower felt after the climb despite it being a little cold because it took us a bit to figure out the hot water in the suite we were in (turn hot water on tub first, then do it on shower and it worked = the trick). We then met up with Eric and Emy over a beer at the hotel bar to discuss how much money we had left after tipping and how we would get more. I have mixed feelings about the hotel and I certainly think the African Tulip was far superior although smaller. The toilet had trouble flushing, the hot water trouble, the crazy expensive buffet that was forced upon us because it was unsafe after dark to explore other options or get to an ATM.. were all issues I had with the hotel but the topper was the $81.50 for one load of laundry for Emily and I. Thankfully, the man (Mussa) who did it for us was very nice and did not charge us the extra 50% for rush service but come on… that is just robbery. After some confusion paying him for all four of us he then tracked us down because Tanzanian’s don’t accept American money that is crinkled in any way or printed before 2009…. yeah… odd. Because of this he actually ended up giving us back several 20’s which meant he ended up not getting enough anyway! 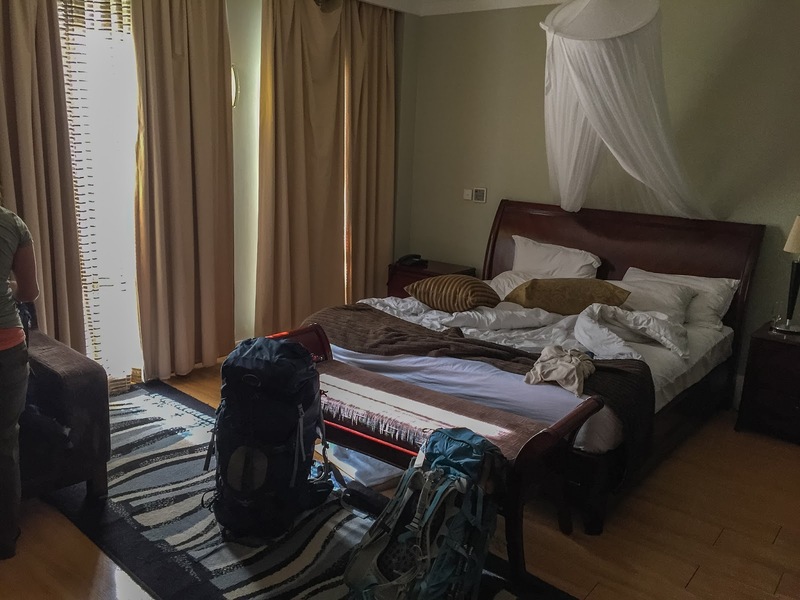 I mean.. we tipped the porters on our climb $80 total to carry our stuff up a 19,000 foot mountain over 7 long days but we had to pay this one man $160 for two loads of laundry that took him about 2 hours to do for us… Just WRONG. The Buffet was ok, but certainly not worth the cost and not as good as the food at the African Tulip and the cute geckos on the walls above us didn’t make up for it. After dinner we retired to our rooms and Emily and I cracked open the wine. My fingers were all cracked and sore from the climb and Emily’s feet were swollen like crazy but boy did it feel great to be clean and sleep in a big comfy bed again. This was the first day that I began experiencing what turned out to be two weeks of minor chest pain…. like the mountain had broken something inside of me… I had drained literally all the batteries for all my devices so I set about charging everything that night before we started our safari the next day.